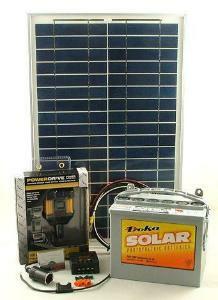 Our 20 Watt solar power kit for do-it-yourselfers. Includes all the parts to build your own system to solar power lights, radios, laptop computer, fan, small TV and lots more. Includes an inverter to power AC devices. We've made it very easy to put together with complete instructions. 6 X 12V = 72 watt-hours per day. If you were using a 15 watt 12V compact fluorescent bulb then you could light the bulb for 4+ hours with the energy you produced that day. But you have a battery! Since the battery holds 32 amp-hours or over 350 watt-hours of energy, you could light the light for 12+ hours before you need a charge, but it's better to charge it sooner. You get the idea - the sun puts watt-hours into your battery and then you use it to power stuff that uses watt-hours. Energy in, energy out. The charge controller prevents the 12V sealed lead-acid battery from over-charging, the inverter converts the 12V DC to 115V AC (standard household-type power). Perfect for beginners that want to get started in solar but don't know where to begin. Customize your own system. House the battery and components in a cooler on wheels or build a wooden box. Cut a hole and mount the panel voltage meter, and weatherproof with silicone sealant from the hardware store. Makes a great demonstration system to show how a basic solar energy system works. Depending on market availability, we may occasionally substitute a solar panel of equal specifications to the solar panel shown above. Ordering information: Includes 20 Watt Solar Panel, Phocos 4 Amp Charge Controller, 32 amp-hour sealed battery, 100 Watt DC to AC power inverter with USB, Voltage meter, 12V DC outlet with fuse.